Midway through Grenville Channel, Klewnuggit Inlet impels long fingers into the abrupt hills of the mainland coast. The middle finger, East Inlet, as well as Freda and Brodie Lakes above it, are included in the park. The best anchorage can be found at the north end of the East Inlet in nine fathoms over a nice bottom. There is an unmarked trail from Exposed Inlet to Brodie Lake near its river outlet and a trail on the northwest side of the river between Brodie and Freda Lakes. 98 km south of Prince Rupert. 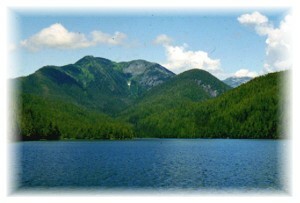 It is about 20 km north of Lowe Inlet. No vehicle access. The closest communities, towns and cities are Hartley Bay, Port Edward, Prince Rupert and Kitimat. History - Established as a Class A park, June 14 1993. The remains of ancient stone fish traps can be found at the outlet of the falls in Nettle Basin. To the north are the remains of a cannery wharf from a large operation in the area from 1890 to 1934. Kayaking can be enjoyed in this area, with landing beaches available. Wilderness/backcountry camping is permitted. Kayak rentals are available in Prince Rupert. Anyone fishing or angling in British Columbia must have an appropriate licence. Excellent tidal water fishing opportunities for salmon and groundfish. Fishing licences are available for purchase in Kitimat and Prince Rupert. Please refer to current fishing regulations. There is an unmarked trail from Exposed Inlet to Brodie Lake near its river outlet and a trail on the northwest side of the river between Brodie and Freda Lakes. For your own safety and the preservation of the park, obey posted signs and keep to designated trails. Shortcutting trails destroys plant life and soil structure. There are opportunities for swimming. There are no lifeguards on duty at provincial parks.